A fun first novel in a new mystery series featuring an FBI Art Crime Team agent. Serena Jones is a FBI Art Crime Team agent based out of St. Louis, determined to be a spectacular investigator…and secretly seeking to solve her grandfather’s murder. Her grandfather’s murder over art. As most of you know by now, I’m leading an online art crime course at the moment. The course is packed with spectacular learners from all over the world and I’ve become obsessed with reading their thoughts and comments. At the start of the course, author Sandra Orchard introduced herself and mentioned that her Serena Jone mystery series featured art crime investigation. I knew I had to get my hands on one of them and Sandra, thankfully, obliged. A Fool and his Monet found it’s way to my ereader and I got stuck in. Gosh this was a fun read! As I said before when I reviewed The Mystery of the Lost Cezanne, I am not very well versed in the genre. Nearly 100% of the mystery novels I’ve read have been about art or archaeology in some very real way. I find it hard to move out of work mode, to select fun reading over dry academic stuff. “There’s only so many hours in a day/my life.” But I see these art crime mystery novels as a way to let myself relax while not straying so far from work that I feel guilty about it. I can’t work all the time, I know, but I can pretend work with a good little mystery. And this week I needed that. I had food poisoning on Thursday and just about all I could do was curl up in bed and cradle my ereader. Criminological theory? Yeah right. Thank goodness A Fool and His Monet was on there already. I don’t know what I would have done without it. Orchard’s clearly done her research. I can recognize elements of various art crimes in the fictional scenes she creates. The crimes are very realistic. A museum that hasn’t taken inventory in a while. A possible inside job. Reluctance to report the art theft. Tightening museum budgets leading to security lapses. etc. etc. No charming, elite imagining of an art theft, no. Orchard describes what could be a real art theft from any museum: the real pressures, the real suspects. “Art crime investigation is primarily about recovery”, and not so much tossing the book at folks. An FBI agent snapping photos of folks with her smart phone whenever, just in case. You never see that on TV. Well, okay, it was on one of the new X-Files episodes but the scene was comedic, he didn’t know how to work the thing. A museum admitting that, you know, there was a chance that the paintings weren’t even stolen, just misplaced. This happens. I was highlighting passages saying “Yep!”, “Well done”, “So true”. As someone who has *ahem* a bit of trouble suspending her disbelief, Orchard’s attention to detail and interest in getting it right sure helped me get sucked into the story. And it was a fun story. I didn’t solve it ahead of time (hooray!) and was excited to see whodunit. I also very much liked the setting. St. Louis as opposed to your traditional fictional art crime locations (London, Paris, New York, whatever). Perhaps this is Orchard’s home turf, but for me it, again, made the crime more realistic. A place where art crime and museum theft really occurs rather than where it is imagined to occur. 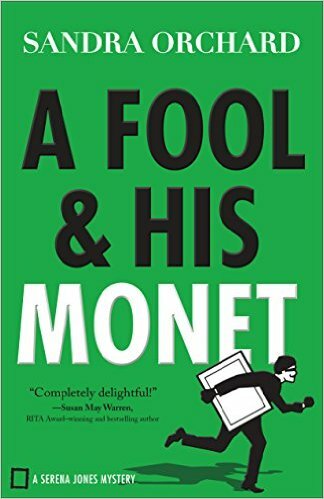 Should you pick up A Fool and his Monet? Absolutely. At £4.61 on Amazon, it’s a steal (hah). Good fun for a rainy day, a train ride, a long lie-in, or any other time you want a light but interesting diversion. I’ll certainly be buying any future Serena Jones mysteries that come out.